If arthritis or other wear and tear conditions have you considering elective surgery or joint replacement, we offer platelet and stem cell procedures as an alternative treatment. With these new, cutting-edge options, you’re able to use your own body to help with the healing process. You’re also able to avoid lengthy periods of downtime and painful rehabilitation that typically follow invasive surgery. Blood is composed of red blood cells, white blood cells, plasma, and platelets. Platelets are responsible for blood clotting and healing. When activated at a site of injury in the body, platelets release healing proteins called growth factors and attract cells that contribute to regrowth (stem cells). This procedure is done in the office setting with local anesthesia. The blood is drawn the same day of treatment and approximately 45 minutes is required for the visit. Once the platelet portion of the blood is concentrated and separated, it is injected under ultrasound guidance to the problem area. The patient may experience between 2-5 days of soreness after the treatment and use of anti-inflammatory medications is not advised during treatment. Depending on the problem, multiple treatments may be required. Studies have shown that PRP may be effective in treating many conditions such as mild-moderate joint arthritis and tendon and ligament injuries. Studies are being published regularly describing the appropriate use and effectiveness of this treatment. Initially, you will be seen in consultation with one of our physicians in order to determine if you are a good candidate for the procedure. This involves reviewing your medical, athletic, and occupational history as it relates to your injury. The injured area will also be examined and possibly imaged with diagnostic ultrasound as that is the imaging modality that will be used when treated with PRP. Any other previous imaging that you have had will also be reviewed. Once the consultation is complete, we will discuss the specifics of the procedure. **Please bring to the clinic any prior scans (eg. X-rays, ultrasounds, MRI, CT) and reports as these will assist the in assessing your condition. Yes. Much research has gone into the development of PRP based procedures. WHAT LINKS TO PUBLICATIONS SHOULD GO HERE? PRP therapy is advised for patients with moderate osteoarthritis in the hip, knee or shoulder or chronic tendonitis in the elbow or ankle, and others. Typically the patient has failed conservative treatment options such as rest, medication, and physical therapy. The cost of PRP treatment may vary depending on the area being treated. ($500-700) Insurance companies, for the most part, will not pay for PRP. This is generally paid for out of pocket. How long does it take the PRP to "work"? PRP does not offer quick pain relief. Pain gradually subsides as the injured tissue repairs and pain relieving factors activate. This can take weeks or months, but when successful, the effect is lasting. If relief is not sufficient at 3 months, a second injection may be performed. Maximum effects are usually seen at 6-9 months. Some knee joints may require 2 injections in closer succession. How soon can I return to normal and athletic activities? Most patients are able to return to work the day following the procedure unless they are 1 in 10 that has a post-injection flare. In that situation, the patient may need an extra day off work. Return to athletic activity depends on the type and site of injury. 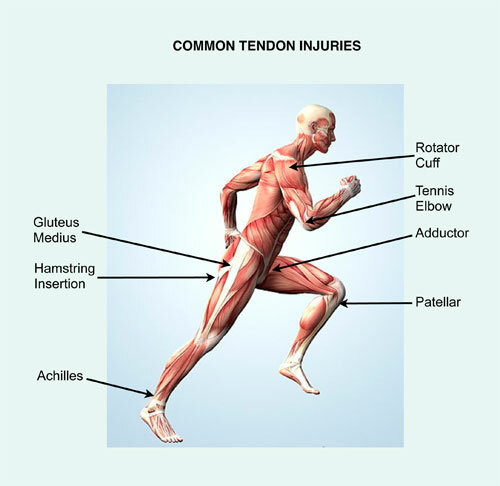 Most chronic tendon injuries that have failed to respond to any other type of treatment will generally take quite a number of weeks to heal. Injections into joints and acute muscle injuries respond a bit sooner. Are there any side effects or complications of PRP? What are the side effects of commonly used cortisone injections (alternative treatment)? Cortisone injections have been widely used over many years to treat sports injuries and arthritis. Unlike PRP injections cortisone injections allow only inflammation and pain to settle down and they do not induce healing. Hence, in many conditions the pain will recur due to lack of healing. Also steroid injections have potential complications such as skin atrophy, discoloration, weakening and rupture of the tendon where injection is given, joint deterioration and infection, among others. If the injection is in your right knee or ankle tendons, you should bring a driver. If the injection is located in any other body part, you may drive yourself home after the injection. Yes, Dr. Lehman will want to see you back in clinic to check your progress. You will be asked to make a follow up appointment 6 weeks following the injection. Do not take anti-inflammatory medication such as Advil, Aleve, Motrin, Ibuprofen, Mobic, Naproxen, Nabumetone, or Diclofenac for 7 days prior to the injection and several weeks after the last injection. Pain medication will be prescribed the day of the procedure to be taken as needed. A regular aspirin regimen (81mg/day) is ok. Tylenol/Acetaminophen is allowed. What is the "typical" response to PRP treatment? The Mayo clinic claims an 80% success rate. However, for a minimally invasive procedure in injuries/conditions that are notoriously hard to heal, that’s pretty impressive. Ultrasound guidance is essential to accuracy of placement and enhancing efficacy of the injection. 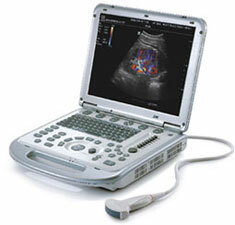 For more information, see our Ultrasound section. What if I don’t get a good enough response with PRP treatment? Then bone marrow stem cell therapy or surgical treatment might be the next step. A healthy amount of evidence suggests that PRP therapy offers great promise in musculoskeletal medicine. Laboratory research and clinical studies have investigated its merit in both soft tissue conditions and bone healing. However, an abundance of level 1 data to support the efficacy of PRP therapy is still lacking. Currently, much of what is guiding the use of PRP in orthopedic medicine is cohort data, conclusions drawn from case studies, and theory generated by in vitro and animal studies. Still, much of that information is undeniably compelling. For this reason, most insurance companies will not support (read: pay for or “cover”) PRP treatment. Moreover, a standard treatment regimen does not yet exist (i.e. Number of injections required, spacing between injections given in series, rehabilitation protocol during and after a series, etc); however, PRP is being used with regularity at the highest levels of sport and in the most highly compensated athletes in the world today. PRP therapy seems to show its greatest potential when used for chronic tendinopathy conditions, such as epicondylitis. Mishra and Pavelko1 prospectively evaluated recalcitrant cohort cases of medial and lateral epicondylitis after injection of buffy coat PRP or bupivacaine. They noted greater clinical improvement in the PRP group by 8 weeks postinjection, with continued improvement at just over 2 years. In what probably are the most convincing findings available thus far, Peerbooms and associates2 provided level 1 evidence by comparing unactivated PRP with corticosteroid injection for chronic lateral epicondylitis. The PRP group eventually exhibited a greater reduction of symptoms than did the corticosteroid group, as well as better functioning by Visual Analog Scale and self-report questionnaire, with sustained improvement over time. Gosens et. al3 provided further data of this study to suggest that their treatment with PRP reduced pain and increased function significantly, exceeding the effect of corticosteroid injection even after a follow-up of 2 years. Kon and colleagues4 conducted a prospective cohort study to examine PRP effects on chronic patellar tendinitis in which conservative means of treatment had not been successful. They observed less pain and statistically significant improvement from pretreatment levels after 3 injections of activated PRP administered every 15 days. PRP has shown encouraging results as a potential conservative treatment for patients with osteoarthritis (OA). In an in vitro laboratory study, van Buul and associates5 cultured human osteoarthritic chondrocytes in the presence of interleukin-1 汝? (IL-1汝?, a potent inflammatory factor in arthritis, then introduced various concentrations of PRP supernatant. In doing so, they were able to show that PRP decreased many of the IL-1汝?mediated inflammatory effects that exert themselves on human osteoarthritic chondrocytes. Sampson and colleagues6 injected osteoarthritic knees with PRP 3 separate times at 4-week intervals. Their findings demonstrated significant resolution of pain and restoration of function compared with baseline for up to 1 year after treatment in a majority of patients. In 2009, Kon and coworkers7 injected PRP into 115 arthritic knees 3 times at 21-day intervals. Statistically significant objective and subjective improvements were noted at the end of treatment and at 6- and 12-month follow-up compared with pretreatment. Giannini et al.8 published similar results in their study of 46 patients. The conclusion of this study was that intra-articular injections of PRP showed a reduction of pain and recover function of the knee joint in patients affected by severe chondropathies of the knee. Gobbi et. al. studied 50 active patients with knee OA to evaluate outcomes in patients with and without previous surgical treatment of articular lesions. Two intra-articular injections of PRP (2.5 fold above baseline concentration without activation) were given to the two groups (operated on, and nonoperated), one month apart. They were followed at 6 months and 12 months. All patients, whether operated or not, showed significant improvement in pain and function scores as well as return to previous activities. A double blind, randomized control trial with level 1 evidence was performed by Patel et. al.14 that demonstrated that a single injection of PRP at a concentration 10 times normal limit was as effective as 2 injections 3 weeks apart (platelet concentration 3x) for alleviating symptoms of early knee OA, and both significantly superior to saline. These results, however, seemed to deteriorate after 6 months, which may suggest that repeated treatments may be necessary. In a more recent prospective, comparative study conducted by Kon and associates,9 PRP was pitted against low- and high-molecular-weight hyaluronic acid viscosupplementation in 115 knees that exhibited degenerative lesions, early OA, and severe OA. Improvement was noted in all treatment groups, but PRP was more effective than viscosupplemention in improving clinical and functional outcomes at 6 months postinjection in patients aged 50 years or younger. In patients older than 50 years, PRP and low-molecular-weight viscosupplementation produced equivalent beneficial results and high-molecular-weight viscosupplementation produced the worst results. The authors concluded that PRP may be a safe, viable alternative to hyaluronic acid injections. The study by Sanchez et al.10 presented the preliminary results of the effectiveness of intra-articular injections of PRP in retrospective cohort study of 30 patients treated with PRP and 30 patients treated with HA. They suggested that knee OA treated with the application of PRP could present new and safe possibilities for enhanced outcomes. A prospective, cohort study with a control group comparing PRP and hyaluronic acid was done by Spakova, et. al.11. They studied 120 patients with a history of chronic pain of the knee lasting at least 12 mos and the radiologic signs of knee OA Grade 1, 2, and 3 according to Kellgren and Lawrence classification. All patients had previously been treated conservatively using analgesics and nonsteroidal anti-inflammatory drugs without success for at least 6 mos. One group was treated with three weekly injections of a medium molecular weight hyaluronic acid (Erectus) and the other with three weekly injections of PRP. No severe adverse events were observed. Platelet concentration was 4.5 fold above baseline and were inactivated. (compared to use of calcium chloride in other studies) The leukocyte concentration was 3.6 fold above baseline. (This has not been standardized at all.) Statistically significant improvement in pain and function at 3 and 6 month followup in the PRP group. 1. Mishra A, Pavelko T. Treatment of chronic elbow tendinosis with buffered platelet-rich plasma. Am J Sports Med. 2006;34:1774-1778. 2. Peerbooms JC, Sluimer J, Bruijn DJ, Gosens T. Positive effect of an autologous platelet concentrate in lateral epicondylitis in a double-blind randomized controlled trial: platelet-rich plasma versus corticosteroid injection with a 1-year follow-up. Am J Sports Med. 2010;38:255-262. 3. Taco Gosens,*”1″ MD, PhD, Joost C. Peerbooms,* MD, Wilbert van Laar,* and Brenda L, den Oudsten,1″ PhD. Ongoing Positive Effect of Platelet-Rich Plasma Versus Corticosteroid Injection in Lateral Epicondylitis: A Double-Blind Randomized Controlled Trial With 2-year Follow-up. Am J Sports Med. 2011; 39:1200-1208. 4. Kon E, Filardo G, Delcogliano M, et al. Platelet-rich plasma: new clinical application: a pilot study for treatment of jumper???knee. Injury. 2009;40:598-603. 5. van Buul GM, Koevoet WL, Kops N, et al. Platelet-rich plasma releasate inhibits inflammatory processes in osteoarthritic chondrocytes. Am J Sports Med. 2011;39:2362-2370. 6. Sampson S, Reed M, Silvers H, et al. Injection of platelet-rich plasma in patients with primary and secondary knee osteoarthritis: a pilot study. Am J Phys Med Rehabil. 2010;89:961-969. 7. Kon E, Buda R, Filardo G, et al. 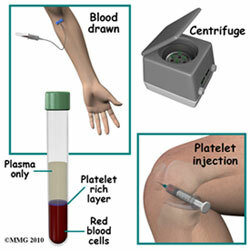 Platelet-rich plasma: intra-articular knee injections produced favorable results on degenerative cartilage lesions. Knee Surg Sports Traumatol Arthrosc. 2010;18:472-479. 9. Kon E, Mandelbaum B, Buda R, et al. Platelet-rich plasma intra-articular injection versus hyaluronic acid viscosupplementation as treatments for cartilage pathology: from early degeneration to osteoarthritis. Arthroscopy. 2011;27:1490-1501. 12. Spakova, et. al. “Treatment of Knee Joint Osteoarthritis with Autologous Platelet-Rich Plasma in Comparison with Hyaluronic Acid” American Journal of Physical Medicine & Rehabilitation 2012; 91:5:411-417. What exactly is the optimum PRP concentration and composition? Does a higher platelet concentration equal a better product or is there an inhibitory concentration that may be counterproductive as some have proposed? Is a leukocyte-rich or leukocyte-poor PRP more effective or is one better than another for specific conditions? What are the specific orthopedic conditions best managed with PRP and what are the proper dose, frequency, and timing of application for those conditions? Is endogenous or exogenous activation preferable? What is the best process by which to centrifuge whole blood and concentrate platelets? What is the most effective delivery medium and how should patients be managed or rehabilitated after treatment? What is the most effective post injection rehabilitation program? 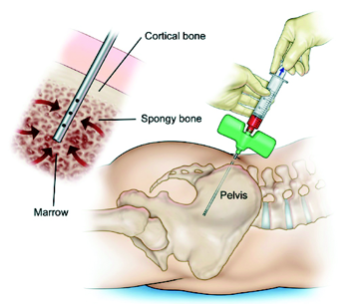 Using a specialized harvest technique, bone marrow stem cells removed from the patient’s hip bone and then injected into the patient’s area of damage. This treatment uses the patient’s own body’s repair mechanisms and growth factors to promote healing. These cells are capable of transforming into a wide variety of tissues including tendons, ligaments and even cartilage. Generally speaking, this treatment appears to be more effective for more severe joint degeneration and is a good next step if PRP is not successful. This minimally invasive procedure is done under local anesthesia. The bone marrow harvesting may result in a dull aching pain for several days to weeks. Because of the potential for infection within the bone, this procedure is done in a complete sterile surgical environment. The entire process will take less than an hour and most patients will have little to no restrictions following the procedure. Not all patients are candidates for stem cell injection therapy. Please see a list of frequently asked questions below to see if you are a candidate. Bone marrow is the source of stem cells that Dr. Lehman uses. She harvests the bone marrow stem cells (called BMAC) from the posterior iliac crest (the back of the hip). Sometimes she will also mix PRP with BMAC. In general, Stem Cell injections are advised for moderate osteoarthritis in the hip, knee, shoulder, ankle, or thumb, where there is not complete collapse of the joint space and not “bone on bone” changes. There are some medical issues (like lymphoma and leukemia) that will preclude you from having a stem cell procedure done. Who is not a candidate for this treatment? Patients with multiple medical issues may not be good candidates (low testosterone, low vitamin D, hypothyroidism, diabetes, smoker). This a partial list; there are other conditions that may limit your stem cell candidacy. Most often to the larger joints, such as hips and knees, but also shoulders, ankles and thumbs. Stem cell therapy is also an option for chronic tendon issues that have been resistant to other treatment (usually including PRP). Dr. Lehman does not currently treat neck or back conditions with stem cells. The cost of this treatment will ultimately be determined by what particular injections are being done. The cost can vary but is estimated at $3,500-$4000 (for one joint). Stem Cell therapy is typically not covered by your insurance company. This is an out of pocket expense. Will this procedure regenerate cartilage in my joint? There is some limited data suggesting an ability to regenerate cartilage in joints, but it also appears that whether or not the cartilage regenerates has little correlation with relief of pain. If there is significant spurring and significant loss of the joint space, there is little chance of cartilage regeneration. What is the success rate of Stem Cell injections? Most patients will have significant relief of pain around 1-2 months post injection. This will often continue to improve for the first 3-6 months after the stem cell procedure. There are patients who will not get any improvement at all from this procedure, probably around 10-20%. This is still an experimental treatment, and there have not been a lot of long term outcomes studies done so far so we are still figuring out who is an ideal candidate to have this done. Typically one stem cell injection followed up 6 weeks later with a platelet rich plasma injection in the office. The protocol is continually evolving, so this is ultimately decided on a case-by-case basis. Because of the potential for infection within the bone, this procedure is done in a complete sterile surgical environment at the Monticello Community Surgery Center in Charlottesville, Virginia. What should I do if I think I am a candidate? Schedule a consultation with Dr. Lehman for an appointment to review your radiology films (x-rays), conduct a physical exam, and determine if you are a good candidate or not.